In another Europe-heavy episode, German Cricket Federation CEO Brian Mantle joins Andrew Nixon (@andrewnixon79) to discuss their victory in European Division Two (11:30), rapid development and structural changes, and his hopes for men's and women's cricket. There is also WCLC to catch up on with Russell Degnan (@idlesummers) including Netherlands-Nepal (0:20) and Scotland-UAE (3:05). Ireland's woes against full-members continued against Pakistan (27:35), and we look at the Jersey-Guernsey inter-insular (31:40) and Singapore-Malaysia Saudari Cup (32:55). In news, there is news about the Asian Cricket Council, the expansion of the Hong Kong blitz, Afghanistan's tour of Bangladesh, and women's cricket in the USA (34:35). Finally, there are previews of Ireland's Intercontinental Cup match with Hong Kong (41:40) and their women's matches against Bangladesh (44:05). A debacle, frankly, but hopefully the West Indies get the money regardless of the overs played. India had alredy won the series, and remain number one on the ratings despite the small hit from an unfortunate draw. The West Indies have had a few of those lately, but they'll need wins to move up, and they never seemed terribly close to achieving one of those in this series. It is worth reiterating that India are an under-rated side at the moment. Also a debacle, though commentators who blame it on the off-season would do well to spend five seconds googling the climate for Durban in winter: drier, with fewer days of rain than any ground in England in July, and any but Perth or Adelaide in Australia in January. A pity too, as the first innings total of 263 from South Africa had set up a match that might have gone either way. Steyn was in rare form when the match was curtailed, so there is much to look forward to in the decider. South Africa, still suffering from their form collapse, took a rather unfair hit with the draw. Though not so bad as if they suffered further losses. The last decade has seen professional contracts expand across both associate and women's cricket. The opportunities have improved player skills, and undoubtedly history will be kind to the first generation of professional players wherever that has occurred. But it also causes a problem. One that has manifested in many of the teams across the world over many years, both at international and first class level. Namely: if you give a small number of elite players generous contracts to improve performance, the next generation won't be able to displace them until they are in steep decline. It was a problem, misdiagnosed largely, when Australian first class cricket aged considerably in the early 2000s, with the Kenyan team of the same era, and more latterly, with the English women, and the Irish team, both of whom bemoan the lack of emerging youth. 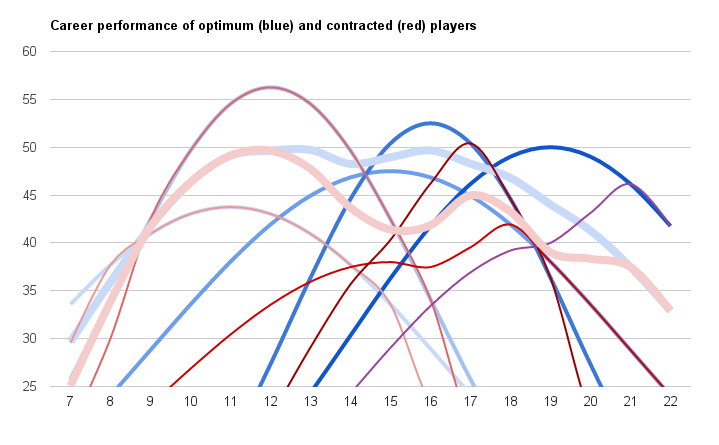 In an optimum selection outcome, players A and B would be selected through years 7-12, A making way for C until year 14, B for D until year 16, C for E until year 18, when C returns for D at the end of their short but prolific peak. The selected pair maintaining an average of close to 50 from year 10 until 18. In the selection outcome with limited contracts, A's declining performance is not matched by an under-developed C until year 14, when they are actually replaced by D. C comes into the side for B a year later, but the lack of experience means the average drops into the low 40s from year 13 to 17. E, similarly, does not emerge from D's shadow until year 19, causing another gap from optimum to selection to form. The numbers in the simulation are made up - if hopefully in the appropriate ballpark. We don't know what the performance advantage of a professional contract is, and there is still a glaring hole in the research over peak performance years. But the general shape will be correct, and that points to a gap between potential performance and what teams get on the field. This may not be the problem right now. There may be no players in Ireland with the potential to perform better than the golden generation in situ. But with only eighteen contracts on offer for the entire squad, there are certainly going to be young players that aren't getting the opportunity to reach their peak. Some, many, will drop out altogether, as non-professionals tend to do. Others will have a late career bloom as the simulated C and E did, but not achieve as much as they ought. This is an under-appreciated aspect of professional development in sport. Across most sports a player will not reach that peak performance until their late-20s. Yet, their future must be decided by their early 20s, because they need to be in the system until they reach the top. Club programmes work through this via a process of drafting and recruiting, second teams and development leagues. They tend to be cut-throat, and not necessarily in a good way. A centralised representative sport like cricket tends towards promoting only the top performers, letting late developing or second-tier talent drop off. Often this also manifests as the flip-side to letting talent drop: of prematurely promoting youth on potential, in the hope that they will develop faster in an elite environment. Perversely, premature selection can be a good thing, as limited opportunities are best given to those with the greatest potential. But it will always be inferior to selecting the best option from a group that have all had the chance to reach their peak. The challenge for all teams, is ensuring they find, and more importantly, improve the talent they have available. Repeatedly, we've seen a strategy of giving contracts to the players you need now, and not the players you might need later, result in ageing stars wondering why noone was there to replace them. Both sides end this series with their ratings roughly as they started; their performances broadly matching what was expected; their reputations neither enhanced nor diminished. New Zealand's batsmen cashed in on the limited bowling attack, with only Nicholls failing to make 80 in the first innings. Zimbabwe only took 6 wickets for 748 across the two innings, but their greater sin was in conceding those runs in just over two days, leaving New Zealand ample time to bowl them out. In this, the Kiwis laboured but persisted, as Zimbabwe faced 213 overs while still finding themselves 254 runs short. Ervine (146), Chibhabha (60) and Moor (71) all made good runs in the first innings, and they ultimately fell only three hours short of taking a well deserved draw out of the game. Sodhi (3/19) and Guptill (3/11), with more than a little help from the umpires, got through the middle order though, and the tail fell quickly. New Zealand remain sixth, despite Sri Lanka's rapid improvement. Zimbabwe the lowest of the Test nations, nominally twelfth, and still sliding. India's return to the top of the rankings has been rather more as a claimant to a vacated throne than conqueror. Yet within a run of form that has encapsulated victories over Sri Lanka, South Africa and the West Indies, they've managed to win in several different ways. Ashwin's spin and Kohli's batting have been the more consistent standouts, but they get contributions from all over. Here it was Shami and Kumar with the ball, and Ashwin, Saha and Rahane with the bat. They had to work for this win, but the West Indies did themselves no favours. Gabriel and Joseph ripped through the top-order on the first morning and with better catching they'd have got into India's long tail with only 140 on the board. Instead there was a 213 run interlude between Ashwin and Saha that pushed the tourists back in front. The loss of the third day made a draw the most likely outcome, but Cummins 6/48 in the second innings wasn't sufficient to stem the flow of runs, or the declaration that left the West Indies most of a day to bat. Bravo aside, they never looked like achieving it, capitulating to a 237 run loss. It was, in a sense, a typical West Indies performance over the past decade. A shuffle forward with some talented and pacey young players, a few steps back with a lamentable performance where they seemed outclassed. For India, number one, and a long string of home matches to cement their status, but noone wins a kingdom from the confines of a castle. As with all the Tests played this week, a very typical performance from the two sides. England's top-order failed as Cook and Root failed, but they managed to stay competitive thanks to Moeen Ali's 108 and some support from Bairstow and Woakes. Or would have, had Younis Khan not picked an opportune moment to find form. His 218 turned a good start, but one that might have ended with a small lead and final day jitters, into an unassailable lead and easy victory. Yasir Shah (5/71) did the bulk of the heavy lifting in the second innings, and while Bairstow (81) made runs, few others did. The series rating indicates that England, overall, had the better of the series (by an average of 40 runs), but they failed at key moments to deal with Yasir Shah or the ageless Younis and Misbah. There is an enormous amount of potential in the English side; they bat a long way down, and they bowl well with seam or swing. But the top order is shallow, and the spinner gives away too many runs. Stokes helps, but by exacerbating both their strengths and weaknesses. They verge on greatness, but are missing some key elements. Pakistan, by contrast, seem to have finally settled on a decent opening combination and number three bat, and they bring a varied and capable attack. But how long their middle order will remain in situ is an unknown. They may reach the heights only to need a rebuild just as soon. Flawed then, like all the top teams, but more consistent from place to place. Six horrific collapses and a 246 run partnership. Marsh and Smith's effort was utterly incongruous, towering over the other partnerships like the Eiffel Tower in central Paris's otherwise low-rise skyline. If anything, Marsh performing well in Asia, where he has had most of his success, merely muddies the water over Australia's selection policy for the Test matches at home. Across the board failures allow a fresh slate; the success of someone they weren't sure they want to play leads to headaches. Starc excepted, though his erratic offerings once the ball was old, and his pace less furious were a problem, across the board failure is what Australia got. Their most experienced players found something towards the end, Warner and Smith with the bat, Lyon taking 7 wickets at a much lower economy-rate with the ball. But the collapses, losing 9/113 and 9/60, were as bad or worse than those of the previous two Tests. Herath, whose 13/145 while injured was merely one more tale to tell in an ever more glorious career, persistently got through the Australian defences with the ball that went straight on. His subtle changes of flight, direction, spin and trajectory keep knocking on the door, and the Australian batsmen guilelessly opened it time and time again. Yet for Sri Lanka, the series may well go down as a triumph of youth. Dhan de Silva's 129 and 65* were glorious knocks: composed in an untenable situation (5/26) in the first innings, aggressive and confident setting a target in the second. While the more experienced Chandimal made 132, it was comparably painful, full of mistimed shots and ground out singles - over 356 balls no less. Add in Sandakan, Mendis and Perera, and the future looks considerably brighter for Sri Lanka than a few months ago. Some rain. Then more rain. Then enough rain they called the game off without Scotland having had a chance to bat. Doubly unfortunate for the Saltires as they have had few opportunities to prove themselves in this edition of the competition. But not much to write about. South Africa enter this series down to seven on the ICC ratings, and with form so bad that a loss to New Zealand is certainly possible. Without de Villiers or Morkel, and further question marks over Philander and du Plessis's form, who South Africa play, let alone how they will perform is a good question. New Zealand are far more settled, and in Williamson, have someone they can rely on to score heavily. If South Africa cannot lift, it could be a close series. New Zealand have already had a series this year they were expected to beat their rating and compete in, and Australia defeated them handily. There are a lot of uncertainties in cricket right now, but you should still expect the home side to prevail. Associate cricket writer Tim Brooks (@cricketatlas) makes a return to the show to discuss his forthcoming book "Cricket on the Continent" on the development and future of cricket in Continental Europe (21:30). Andrew Nixon (@andrewnixon79) joins Russell Degnan (@idlesummers) to discuss a wide range of cricket occuring in Europe. There are reviews of Afghanistan's victory over Netherlands in the I-Cup (0:32) and their tour of Ireland (4:28); the women's world cup qualifiers in EAP (9:00) and Europe (10:35); and the women's European tournament won by France (11:40); the Irish women's matches against South Africa (14:20); the U-19 divison 2 European World Cup qualifiers (16:30); a European U-15 tournament in Guernsey (18:10); and the Nordic-Baltic Cup in Finland (20:15). Some news from Spain regarding the La Manga facility (46:45), the CPL and US cricket (47:30) and on the Olympics (52:00) and the ICC Test championship (55:10). Finally we review the forthcoming WCL matches between Netherlands and Nepal (57:45) and Scotland and UAE, Ireland's matches against Pakistan (60:50), and the European Division Two T20 tournament (62:15). A match that for two days looked like the easiest of Indian victories turned, first on rain with only 62 overs across days 3 and 4, and then on the bats of four twenty-four year-olds. Jermaine Blackwood (63 off 54), Roston Chase (137* off 269), Shane Dowrich (74 off 114) and Jason Holder (64* off 99) batted the length of day five, regained the lead, and achieved an unlikely draw. The top-order failed, as did the bowling - notwithstanding Chase's 5/121 - and Blackwood's 64 in the first innings (also faster than a run-a-ball) was the only score of note in another collapse to Ashwin. But a draw is a draw, and if the middle to lower order has something about it, then that means they only need a top-order and some front-line seamers to be something like a competitive side. India will probably not worry too much. Rahul (158) and Rahane (108) scored runs, and on most other days they'd have won with some time to spare. They lose a handful of ratings points, but not enough to drop into third, and in any case, they still gained points on Australia. West Indies slightly arrest their drop, though as ever, they remain marooned between seventh and ninth. In the post-mortem on Pakistan's failure to firstly win, and then at least draw this match, the scale of England's comeback has been largely obscured. On the first two days minus one ball, they lost 10/297 and conceded 2/257. In the remainder of the match they took 18/354 and scored 6/400. Yet, despite the score differential, it wasn't a storming comeback. Rather, a series of rearguards that eventually allowed them the opportunity to win. Ballance (70) and Moeen Ali (63) getting the total to something reasonable from 5/158; Woakes (3/79) and to a lesser extent, Broad keeping the Pakistan lead to 103, and more importantly, forcing them to grind at less than three runs per over, when tiredness ought to have set in; Cook and Hales overturning the deficit without loss; Root and Vince building a lead when early wickets might have derailed the comeback. Then from a front-running position, Bairstow and Moeen Ali accelerating, and Finn and Anderson breaching the top-order when there was little happening. Pakistan, by contrast, got 152 runs from Sami Aslam and 177 from Azhar Ali (more than half their total), and 7 wickets from Sohail Khan (almost half). The other players have produced in this series, but it is England's ability to find something from someone that is making them a difficult opponent. They push back to third place with the win, and have the momentum to find themselves higher by series end. As with any cricket contest, there are really two matches being played: that between Sri Lanka's batsmen and Australia's bowlers, and that between Australia's batsmen and Sri Lanka's bowlers. The first, Australia won, Starc took 11/94, Sri Lanka were bowled out for 518 across two innings - substantially less than a team ought to have if they want to win - with only Mendis (86), Mathews (54 and 47) and Perera (49 and 64) contributing. The weaknesses they displayed in England are still evident, but the emergence of Mendis and the promise of de Silva (37 and 34) are good signs in a rebuilding team. Nevertheless, if you'd offered that chase to Australia before the Test match they'd have taken it, and at home, it would likely have resulted in an innings victory, not a demoralising 229 run loss. 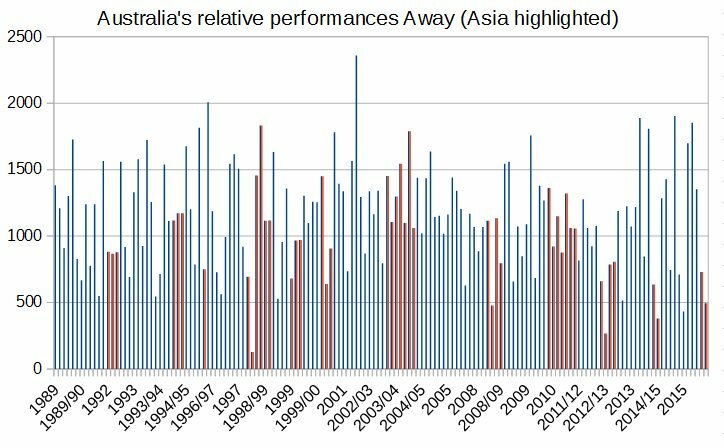 Because Australia's batsmen, in Asia, are incredibly, historically, poor. It is worth dwelling on some ratings numbers to indicate how bad they've been in their eight consecutive losses in Asia. Firstly, this is the worst Australian side in Asia of any era, with an opposition adjusted game rating of 594.1, well below the performance of the 1980-83 era (813.1) or the WSC team that proceeded it (895.0). This disparity, traditionally 200 points or 100 runs, is currently 754 points or 377 runs. A staggering number. Australia, in Asian conditions, is the worst Test side in world cricket bar Zimbabwe, and it is arguable that Afghanistan's triple-headed spin attack would produce an intriguingly close contest. Sri Lanka have bowled well, but they've bowled as a side that knows that they can take wickets as long as they bowl tight lines and work the batsmen over. Warner and Marsh have scored some runs, but given the impression they need to hit ever half offering for four, as the end is nigh, Smith looks comfortable but finds ways to get out, Voges regressed into reverse sweeps where previously he looked safe if shot-less, while Burns and Khawaja haven't got in for long enough to judge. Lehmann was a find player of spin bowling, but whatever he is advising his charges isn't translating onto the pitch. As with previous tours to Asia, their confidence is shot, and the chance of a redemptive result is negligible. Unfortunately, there is another tour to India looming, and nothing we see over the Australian summer will prepare them to face it. The issue of over rates in Test cricket is one of those periodic issues that engenders more hang wringing than fixes, and more articles than effects on the game itself. Nevertheless, as my thinking on it has evolved since the last time I wrote on it, and as Liam Cromar has proposed a possible solution it is worth revising. In the main, Cromar is correct: the current regime of fines and possible suspensions has little effect on the match at hand, and it has broader negative effects he didn't mention. Not least, the sight of part-time trundlers ripping through overs to get the rate up, in lieu of the competition at hand. But I am less convinced by the broader structure of "90 overs in a day" that is the rule, but so regularly breached that the official close is now effectively 6:30pm. Firstly, the placing penalty runs on the bowling side is likely to cause some problems at the margin, as batsmen - who regularly block an over at the interval if they can avoid one - slow play just enough to earn an unjust penalty. The current measurement, over a whole Test match, allows for some adjustment and leniency, but it is harder to do that within a match context. Unintended consequences being what they are, any penalty runs approach probably shouldn't be working with a fixed number of overs in mind. Especially given question marks over the number itself. Secondly, it isn't clear that 90 overs in a day is regularly possible, and may even not be desirable, if it means preventing pace bowlers from operating. The walking pace of an adult striding, but not exerting themselves is 6km per hour, 100m per minute, or 1.6m per second. A 30m runup therefore, with a 10m follow-through, requires some 24 seconds to complete, another 10 to run in from plus the play itself (5-10 seconds). That's 45 second per ball, or four and a half minutes per over; 30 seconds longer than allowed. Add in drinks, changing ends, and wickets and it becomes clear that we need a better understanding of what is taking all that time. Were it cricket seasons, I'd provide that, as precise timing of these can be done at the ground, and would be useful if someone wanted to shave time to speed up the game. Read these as estimates as a starting point. That amounts to a total time of 23,980 seconds or 400 minutes. Hence, a typical, if interesting, day is expected to take 6 hours 40 minutes. Accounting for a few extra minutes at the end of each session (already begun overs), it is possible to squeeze in 90 overs a day, but the emphasis is on squeeze. More likely, the ideal of 90 overs in a 6 hour day is unrealistic outside Asia where spinners will operate for much longer. Thirdly, it isn't clear why 90 overs is the aim, or the standard. From the 1980s onwards, once four pace bowlers, and little medium pace, became the norm, the rate dropped to 13.5 overs per hour (81 overs per day), where it has stubbornly remained. The early 1990s had over rates in the mid-70s during West Indies vs Australia series - one of the ABC almanacks lamented the pace. But the matches themselves weren't overly changed - certainly most finished on the fourth or fifth day. The true question is whether the game is moving, and interesting. Excessive drink breaks, glove changes, field setting, team meetings, pointless delays around rain or light, and frivolous umpire referrals are a bigger problem than the actual rate of play. "Cricket time" depends on the flow of the match, the approach of each side, and the state of play. What matters is that the umpires keep the players playing. Which is why I'd suggest an alternative approach. Relying on players to police the clock, as with any rule falling under the spirit of cricket, will be more often broken than enforced. Players are not Gentleman, and a simple set of time rules, enforced by the umpire, would bring cricket into line with other sports - such as baseball, or tennis - that (despite lacking any need for a clock) maintain a strict schedule for the fans. A maximum of 180 seconds to be ready after a wicket. A maximum of 30 seconds to bowl after the previous ball goes dead. Other breaks, such as drinks or replays are at the discretion of the umpire already, but they should be prodded to keep them moving. These are harsh, but not excessive, as a lot of time wasting occurs in close matches, and the first warning is sufficient to lay down a line for general slow play. The fines, suspensions and expectations that a bowling captain will watch the over rate while trying to captain will disappear (as will the complaints about over rates). But most importantly, play will continue, at the pace it ought, unless a team asks for it to stop. And players would quickly adjust to the reality of a fixed time to make field changes, or have conversations, as they do, already, in making DRS referrals. We could dwell on Australia's failures in this match: their hard hands and poor footwork; the shot-selection of Smith and Nevill that turned a sizable first innings lead into an opportunity to taste defeat; the marked sameness of Lyon's bowling striving too much for bounce or his inability to prevent runs on the on-side; or the scattershot of Mitchell Starc whose average is fine but needs a plan for his second and third spells. They are largely reprisals of the same failures that occurred in previous matches, particularly Asia. Sri Lanka aren't a good side, but Australia outside their comfort zone aren't either. Instead let's focus on Herath and Sandakan. Sandakan (4/58 and 3/49) is the more obviously exciting player, and certainly the easier to commentate on, turning the ball sharply in to right-handers with a wrong-un that left Mitch Marsh bemused. But Herath (4/49 and 5/54) has a subtler skillset that creates openings where none seem apparent. Every ball could loosely be described as left-arm orthodox, there is no doosra, but his arm follows a variety of paths, from high to low, the ball comes out flat to looped, the pace sharp to held up, the spin skidding or cutting, the bounce at the ankle or riding the bat. The batsman who uses his feet will often fail to make it to the bounce, the one who plays for spin will see it thud into his pads, the one prodding at something innocuous feeling it rise off the edge. Its the work of a master, and it needs to be better appreciated, not least in how we can describe and analyse the way he goes about it. Mendis needs acknowledging too: 176 off 254 balls when the next best score is 55, on track for the Bannerman record for much of his innings. He showed, again, that the Australian bowling can be attacked and defeated. Conversely, Nevill and O'Keefe (and to an extent Voges) showed that you can face out a relatively large number of overs against Herath without being dismissed. But they need to be able to score too, and it isn't clear that, Smith's nudges and Marsh's wallops aside, that they know how that will happen. Interestingly, and disturbingly for the quality of the ratings, Zimbabwe missed their expected margin by the least of the four losers last week: 184 runs. It also wasn't a substantially worse loss than West Indies versus India, nor Pakistan versus England, though it was to a (marginally) inferior side. That's the positives. The negatives are that they were 8/72 and 5/86 in their two innings, compared to 6/576 when New Zealand pulled the plug on their innings. Their shortcomings are also difficult to fix. Five batsmen were shot out to short balls from Wagner, others to Boult's swing. Neither of which they can easily practice against. They fed Taylor and Watling's cut and pull shots, implying poor lengths, but they lacked penetration, with Watling in control for 97% of his deliveries. The comparable figure for Sean Williams 119 was just 85%, and more often than not, innings of that type are short. If the two tier championship gets up they'll benefit from playing against Afghanistan and be competitive with their peers, but they'd be at risk of further relegation too. With an impoverished board and better opportunities elsewhere, maintaining interest in becoming a good Test cricketer is going to be very difficult regardless of what happens. The Netherlands had seemingly turned around their dire four-day record in this tournament with tight victories over Scotland and the UAE. But with only one score above 230 in their three matches to date, the seeds of their failure against Afghanistan were already planted. Dawlat Zadran (4/32) and Yamin Ahmadzai (5/29) blew through the Dutch on the opening morning, and the visitors were in front, 4 wickets down by stumps. As with the previous match, the batting of the youthful Shahidi (83) and Rahmat Shah (51) bodes well for a team in need of renewal. The team as a whole failed to string together partnerships, but all but the tail got into double figures and built a 195 run lead. Rippon followed his 5/79 with 80 in the second innings, scored at good pace, but supported by noone, as the match finished inside two days. Another young player, Zahir Khan, taking 4/29. Afghanistan briefly top the table on the back of the win, but they need to defeat Ireland or hope they drop points - which is likely, with the hardest draw and two home matches to play - if they are to stay ahead. The cup is not yet a two horse race, but it is becoming increasingly likely that it will be. It needs Hong Kong, who play all three teams ahead of them, and Scotland, who have three winnable matches and the Irish to challenge.